Something Good: Pear Honey – Guest Post by Who Put Me In Charge of These People? Gretchen, a.k.a. Texan Mama, spends her days finding rogue singleton socks and tending to the dozen feet that wear those socks. She resides in the Dallas-Fort Worth Metroplex with her husband, 5 children, and one dog (who doesn’t wear socks). In her spare time, she blogs at Who Put Me In Charge Of These People??? When it comes to my mad skillz in the kitchen, they are pretty much non-existent. My kids’ favorite meal is Hamburger Helper and my husband usually just looks at what I’m cooking, then fixes something separate for himself. And, to answer your question, YES I find that insulting but I am so used to it by now, I have become desensitized. At least he is doing the fixing for himself. That fair, by the way, is exactly the stuff you see (or read about) in Charlotte’s Web. There is a parade, Fair Queen pageant, Kettle corn, all types of livestock judging, carnival rides, (local) celebrity cow milking contest, etc. 4-H has a booth selling Lemon Shake-Ups (If you’ve never had a lemon shake-up, you’ve never tasted summer.) And, of course, in the exhibition hall there are lots of submissions for judging, like quilts, canned foods, fresh foods, artwork, hand-sewn clothes, woodworking, etc. I submitted pickled asparagus, green beans, tomatoes, dill pickles, apples, and pear honey. That’s Texan Papa in the green ball cap. He was a “local celebrity” because he’s a pastor. It doesn’t take much to be a celebrity, I guess. There’s Peppermint Patty, Charlie Brown, and Linus eating watermelon slices off of a frisbee after the very long and hot parade. (I walked with PP and Linus in the parade, 6 months pregnant, pulling a wagon and throwing out candy. Linus walked with the Cub Scouts.) See what I mean about it being a real country fair? Now, in case you don’t know what pear honey is, I am happy to tell you: It is a wonderful sweet spread, much like the consistency of marmalade, but with a taste of honey. However, the honey does not taste sugary-sweet, but rather fruity-sweet. I found a recipe for Pear Honey when I was given 2 bushels of very ripe pears and had no idea what to do with them. Well, as it turns out, pear honey is best made with overripe pears. It’s SO simple to make. If you have pear trees or if you get pears from a neighbor, I highly recommend making it. It is so unique and your friends and family will gobble it up! I even made some and put it in small half-cup or half-pint jars and then gave it out with a mini loaf of pound cake at Christmas time. It was a perfect teacher gift and also for the church secretary and organist. Put pears and pineapple juice in a large stock pot. Add sugar. Bring to a full boil and reduce heat to medium for a gentle boil. Cook, stirring constantly, for 30 minutes. Pour into prepared jars*. Process in boiling water for 10 minutes. Makes 6-7 pints. When you first pour the mixture into the jars, it will seem a little thin, but it will thicken while the jars are processing in the boiling water. And, once cooled, it will thicken even a little more. *Prepared Jars are canning jars that have been washed thoroughly and warmed in a canning pot with simmering water. The jars are kept in the simmering water until they are ready to be filled. Processing in boiling water means, once the jars are filled, and new caps and rings are screwed on (tight enough to close but not TOO tight), then the jars are returned to the simmering water with at least 1 inch of water above the caps. The water is returned to a boil. This is NOT using a pressure canner. Combine prickly pear juice, lemon juice and sugar in a medium size saucepan. Cook over medium high heart, stirring frequently. Once mixture begins to boil, start timer and boil for two minutes. All at once add liquid pectin. Allow mixture to come back to a boil and cook for two to three minutes more. The longer you cook, the firmer this jelly will be. Remove mixture from heat and pour into sterilized 8 oz jelly jars. Fills four 8 oz jelly jars. Process in a boiling water bath for 15 minutes. See canning instructions here. Note: Use only LIQUID pectin for this recipe or you will get unreliable results. 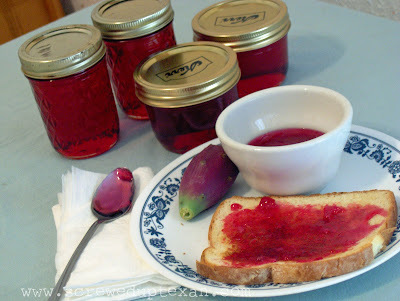 I’ve written instructions on how to make Prickly Pear Juice.